You get a little bit of traffic but the blog is a real chore. 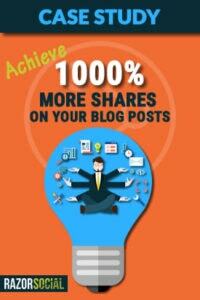 Imagine if blogging was a key revenue generator for your business. ….but don’t take my word for it! We have a great community called RazorBlazers where we train a couple of hundred businesses and marketers on an ongoing basis on a wide range of topics. Recently, we set our members a blogging challenge and there were some very interesting results we want to share. The challenge was to write one awesome blog post. Over the last few years we have built up a lot of experience with how you can attract a lot of traffic to a blog and we wanted to share what we have learned over the years so that they could achieve great results on their blog too. Here’s an example of one of our posts that was shared 24,000 times. So we shared some of our tips and tricks and set them the challenge to come up with a blog post that was much more popular than any other piece of content on their site. The results were very interesting and there is lots to learn from them. Liz Alexander is a futurist strategist and while she has mixed opinions about blogging, she always loves a good challenge. 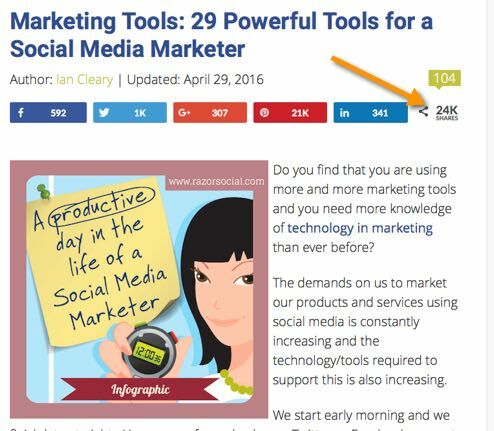 Let’s take a look at the number of shares this post achieved compared to other posts on Liz’s site using Buzzsumo. So as you can see Liz got over 1,000% more shares on the article she wrote for the challenge, over the other posts on her site. 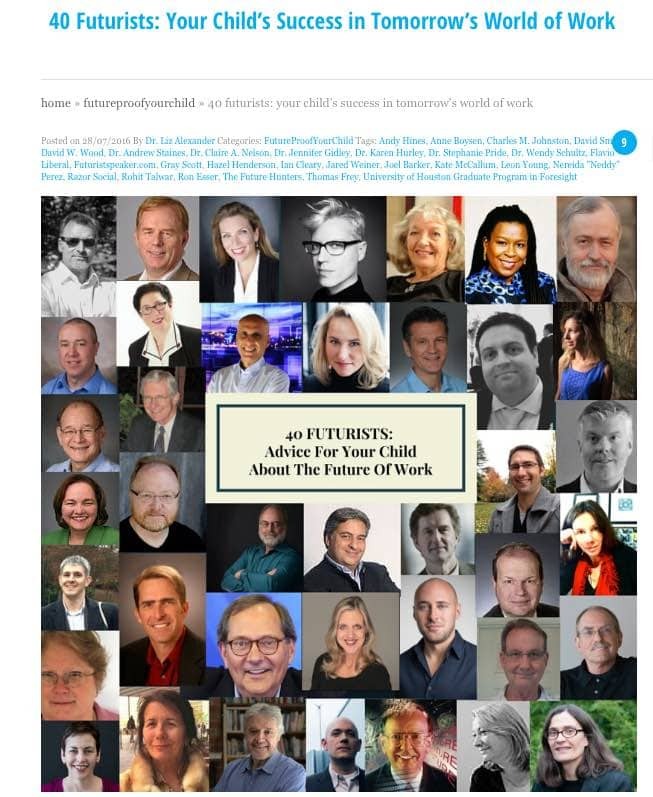 Based on a comment saying that this post should be shared with all school principals around the world, Liz began identifying educationalists on Twitter and included their handles in her tweets, which attracted a lot more shares. She did the same with two educational associations that produce newsletters and magazines, that go out to this audience, too. Liz picked up several business opportunities: A New York business association has offered her a paid speaking opportunity to talk to their members — which could result in future clients. And a University has asked her to come and talk to both their faculty but also lead workshops for their students. Again, paid consulting gigs! Over 1,000% increase in shares over previous posts. It was shared by a number of prominent associations to their members, including NACE (National Association of Colleges & Employers); NASSP (National Association of 2nd School Principals), and several school districts, like USC (University of Southern California school district). The author of a career book asked if she could quote this post in the updated edition of her book (to which Liz said yes, of course!) – her publisher is Penguin and that book will come out early next year, so Liz’s post is going to “live” for a very long time in the pages of You Majored In What? by Dr. Katharine Brooks. I think it’s safe to say that Liz is now very interested in blogging. Gareth and his partner are building a social media tool called Content Sleuth, which provides social media automation, analytics and outreach for content marketers. 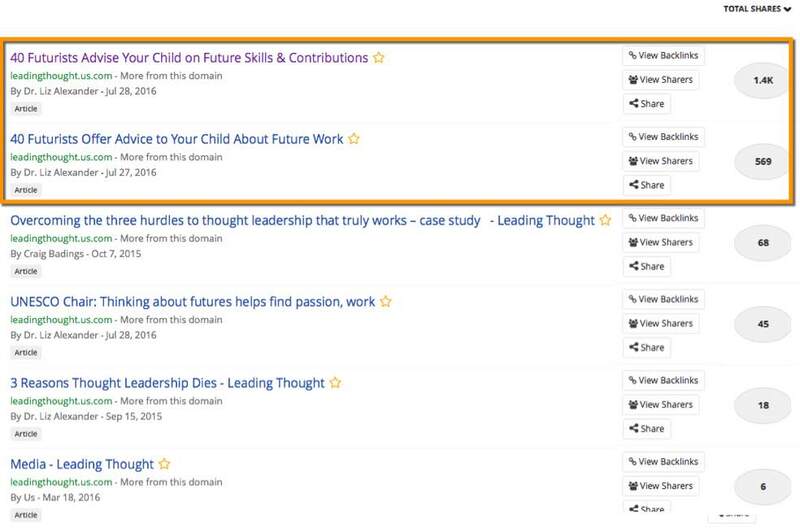 Gareth has only written 3 blog posts on his site so far (it’s a new site!). Sent two emails to his list of email subscribers – an initial email promoting the initial release of the article and then a follow-up. Contacted influencers to contribute their opinions and then encouraged them to share the article. Setup ads on Twitter, LinkedIn and Facebook, including specifically targeted ads and remarketing ads. Tweeted quotes from the influencers who contributed. Contacted every tool we reviewed in the post and let them know about it. Used Quuu to promote the article in the relevant category. A nice increase in traffic. Remember, this site is very new so it’s great to see the traffic growing. 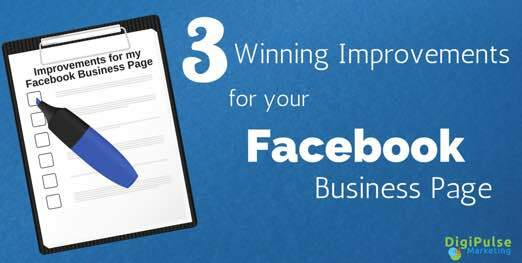 Marie Collins said that writing blog content didn’t come naturally to her so we were delighted to see her post on 3 essential improvements to make on your Facebook page doing really well. She promoted it across all the social media channels and invested a little in Facebook ads. The increased level of promotion makes a big difference. For any blogger out there if you are writing content but not promoting you won’t do every well. With a little extra push it makes a big difference! Marie got a coaching client after publishing the post. A blog is a hugely important part to your online presence so if you’ve left it behind maybe it’s time to resurrect it again. If you create the right content, use the right tools and promote it in the right way your blog can drive significant traffic to your site. More relevant traffic = more opportunities to sell. Our challenges are all about getting our RazorBlazer community to take some action. Maybe you should join us?